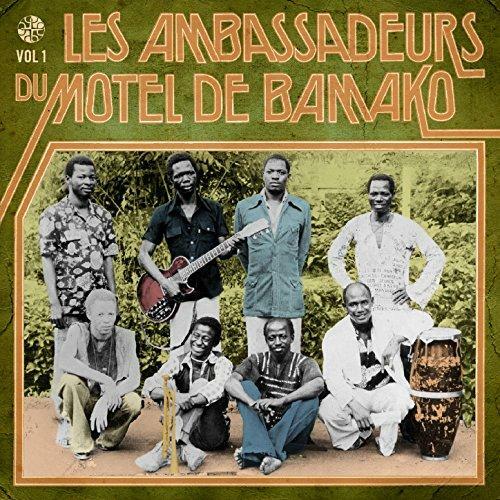 Mali’s Les Ambassadeurs recently reunited for a brief European tour; that makes this 2-disc compilation of their original 1975-77 recordings timely. In truth, a set like this is more overdue than timely – Les Ambassadeurs were hands-down one of the greatest bands of West Africa’s golden age and most of these tracks were only available until now on the original singles and LPs. Led by brilliant guitarist/arranger Kante Manfila, this was the band that made Salif Keita a star and introduced the world to many of Mali’s finest: guitarists Amadou Bagayoko (Amadou & Mariam) and Ousmane Kouyate (Keita’s long-time music director), organists Idrissa Soumaoro and Cheick Tidiane Seck, and balafonist Keletigui Diabate (Habib Koite) to name a few. Like their peers the Rail Band and Bembeya Jazz, Les Ambassadeurs specialized in authenticite: a new approach to music both totally modern (electric instruments; the influence of jazz, rock and R&B) and fully engaged with centuries-old Mande musical traditions. This style is one of Africa’s great contributions to world culture – here you’re hearing it as it was being invented. A peak musical experience.